Thank you for visiting my fundraising site. My name is Cindy Slagter Spackman and I'm incredibly excited to embark upon a new chapter in my life as a social worker and community advocate. As many of you know, I've spent the past 9 ½ years in Sacramento, California. During this time, I've been fortunate enough to work with an amazing team at Rebuilding Together Sacramento. I've had the chance to gain experience in a multitude of roles within the organization and most recently, have been the Program and Development Director for five years. 2013 has presented itself as a year to create some change and take the next step towards growing and developing in an area I'm passionate about. Having a home is one of life's most important needs. Having a safe and healthy home has a direct relationship to quality of life. My mission is to start an affiliate of Rebuilding Together in Austin, Texas where we can continue the organization's goal to provide assistance in improving homes and lives of those in need through free home repairs provided by volunteers. I have been traveling to Austin, at least annually, for the past 9 years. Over time, I have developed an affinity for the community and surrounding areas. I have initiated conversations with key stakeholders within the housing community and Rebuilding Together national to confirm that there is, indeed, both a need and interest in having an affiliate presence in Austin. § Registration fees for Experience Austin Leadership program. § This program will further assist my preliminary networking efforts as well as provide the foundation for me to better understand our proposed service area and surrounding communities. I have a high-level project timeline with deliverables that I'm happy to share, should you be interested. I sincerely thank you for both your time and consideration of my fundraising request. Please do not hesitate to contact me if you have any questions or if I can provide you with any additional information. I am ready: so Let's Start Rebuilding Together! Happy Holidays from Rebuilding Together Austin! THANK YOU for your support of Rebuilding Together Austin from the inception! The dream to start an affiliate became a reality and our first year has been amazing. We set out to repair 3 homes in in 2014 and we exceeded our goal by repairing 15 homes! There is a certain magic that happens on a volunteer workday; families of homeowners ask about "paying it forward", volunteers learn new skills, teams become more confident and collaborative, perfect strangers become friends and lives are changed in ways we can never imagine! 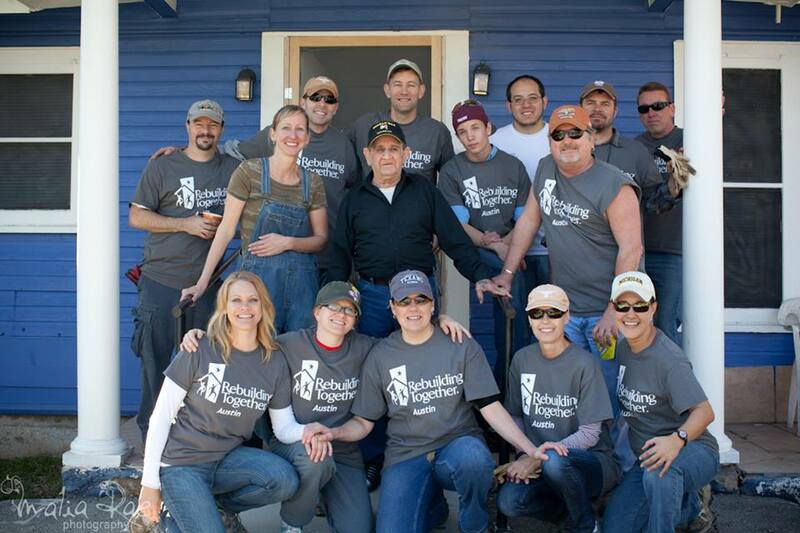 The gift of giving back not only changes the lives of volunteers it changes the lives of the homeowners we help. Safe, healthy and energy efficient homes are not the only result of the mission of Rebuilding Together. This is an exciting time for Rebuilding Together Austin. We are entering our second year with a plan to repair 30 homes and 2 non-profit facilities. We are gearing up to start a Safe at Home program to install safety modifications in the homes of seniors to prevent falls. We are forming new partnerships and recruiting more volunteers to help with home repairs. Without your support Rebuilding Together Austin would not be where it is today. I want to thank you for your belief in the vision and cause of helping low income homeowners stay in their home. This has truly been an amazing and powerful year both personally and professionally. “Volunteers just showed up and began working. They were laughing and had smiles on their faces. We are not sure what we did to deserve this help but we are so happy!” –Mr. & Mrs. W.
We are seeking donations to support home repairs in 2015. All donations are tax deductible. Thank you for your consideration and continued support. As always, if you know of anyone who would like to support our mission, please share this request. 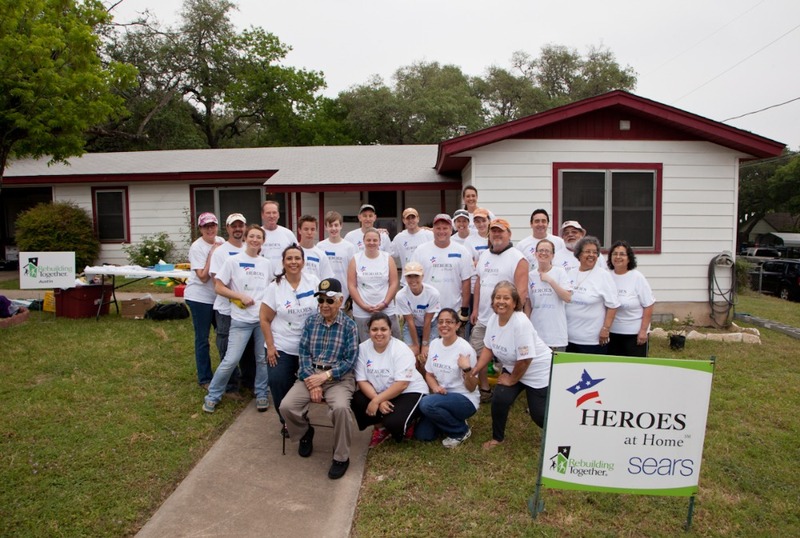 Volunteers Help 2 local Veterans! Our very first project in February 2014! Happy New Year! Rebuilding Together Austin has some exciting news! Our very first workday is scheduled for Feb 8 & 9, 2014! We have a signed Affiliate Partnership Agreement from the national office as well as volunteer liability and directors and officers insurance. We are ready to get to work! The homeowner we are honoring is Mr. Romero. He is an 81 year old Korean War Veteran. A native of Detroit, Michigan, Bernardo, his three brothers, and his parents moved to Austin in the early 1940's when his father took a job as a cook at the Greyhound Bus Station. Young Bernardo enlisted in the Army after high school, went through tank training at Ft. Knox, KY, and eventually saw combat in Korea. When he got back to Austin after the war, he landed a job as a city bus driver. After that he worked for a tire company, and later at a linen cleaning service. He eventually opened his own tavern, La Plaza Bar, which was originally located across from the Ritz Theater on 6th Street. He later relocated the bar to the Riverside area when rising rents on 6th Street forced him to move. Around the time he retired in 1996, Mr. Romero developed glaucoma and cataracts, which ultimately robbed him of his eyesight. Mr. Romero had a dog named Hog Jaw who he had since he was a puppy. Hog Jaw lived 14 wonderful years with Mr. Romero. Hog Jaw passed away this summer. Mr. Romero is ready for another companion and he is working with the PALS (Pets Assisting the Lives of Seniors) program at Meals on Wheels and More to adopt a new dog. In order to make this a reality we need to secure his back yard. Rebuilding Together Austin's first workday goal is to build 125 ft of fencing in Mr. Romero's back yard to ensure the safety of the new dog. We will also perform some minor electrical work and yard clean up. Thank you for your consideration and continued support. As always, if you know of anyone who would like to support this project, please share this request. Please visit http://www.gofundme.com/6jsyxk f0r the project specific donation page. Thank you! I want to take this opportunity to say THANK YOU for your donation to the start-up of Rebuilding Together Austin! As the holiday season is upon us and I reflect back over the last year, I am so grateful for the opportunity to pursue my dream of starting an affiliate of Rebuilding Together here in Austin. Providing low income homeowners with the ability to stay in their homes through home repairs and safety modifications brings me such joy. I love that my work allows me to give back to the community in such a way that changes lives. I want to provide an update on where Rebuilding Together Austin is in the start-up process. One House at a Time, a local non-profit who holds a similar mission to RTA, has made the decision to discontinue their services. There were several meetings between RTA and One House at a Time and the outcome was the handover of key volunteers and a donation of a project trailer and materials. The founder of One House at a Time fully supports the mission of RTA and has offered to help with fundraising locally as well as hold a larger fundraising event in the spring of 2014. We are thrilled with the offer to help us get off the ground, especially from a local non-profit who has been engaged in the community for over 5 years. In January 2014 Rebuilding Together Austin will purchase volunteer liability insurance and Directors and Officers insurance. We had a very generous offer from Meals on Wheels and More (where I am employed full time) to match half of the cost of the insurance. We have raised the matching amount and as a result of our insurance, we will be able to work on our first project in January 2014! Currently, the partnership between Meals on Wheels and More and RTA is to provide low income homeowners with repairs through two different models. Meals on Wheels and More hires contractors to perform skilled work and RTA uses volunteers to make the more general skilled repairs. This two fold model ensures that we leverage funds to complete more work and provide the homeowner with a safe and healthy home. I Live Here I Give Here is an Austin non-profit that encourages personal philanthropy to help improve the community through connecting individuals to non-profits. In March 2014 they host an event called Amplify Austin. It is a 24 hour period of giving that encourages individuals to donate to non-profits. Last year they raised over 2.8 million dollars and over 300 non-profits participated. RTA has been approved to be one of the non-profits that will benefit from this year's Amplify Austin! Finally, we plan to hold 2-3 mini projects between January and March 2014 with our "official launch" on National Rebuild Day in April 2014. This is such an exciting time and I can't thank you all enough for your support over this past year. This dream is becoming a reality and I couldn't be more proud to bring Rebuilding Together to Austin to continue the mission of the great work we do! Happy Holidays to you and your family and my wish is that your new year is filled with love, happiness, joy and gratitude. Hello everyone! It has been quite some time since my last update. Today marks my 6th month anniversary since I have arrived in Austin. So many incredible things have happened on my journey to start Rebuilding Together Austin (RTA). The most exciting news is that Rebuilding Together Austin is officially a tax "“exempt, non-profit organization! I received a letter from the IRS with the good news! I honestly expected it to take longer than it did so you can imagine my surprise and excitement when I opened the mail. This allows me to write grants and apply for funding for projects and seed money. This also means that any donations made to RTA are tax deductible. I am still working for Meals on Wheels and More (MOWAM) in their home repair program. It is a wonderful organization and the staff has been tremendously helpful and supportive of my goals related to RTA. My plan moving forward is to continue to work for MOWAM as I build up Rebuilding Together Austin. It is a perfect fit in terms of client referral and partnerships/collaboration on projects to help low income homeowners. It is a great way to get RTA involved in a few projects before our big launch on National Rebuild Day in April 2014. In August, I spent a few days with the staff of Rebuilding Together Houston. They have offered to drive to Austin to support RTA's first project. We discussed best practices related to start up and what further support might look like between our organizations. They are a wonderful group of people doing really great work in the Houston area! I have spent the last 3 months exploring more of Austin and it's unique treasures. I have also become engaged in the non-profit housing industry and have attended several trainings related to home repair and funding. I have toured neighborhoods in Austin that have the most need in terms of home repair and I have visited successful affordable housing projects that change people's lives by providing affordable rent and accessibility. The Housing Repair Coalition meetings continue monthly which has provided an opportunity to become better connected with the City programs as well as all the other non-profits in the area that provide home repairs. The collaborative nature of this group still amazes me. Best of luck, Cindy. Keep up the great work! I served with Rebuilding Together Twin Cities as an AmeriCorps member and am so excited to support a new affiliate in my current home of Austin, Texas!